In this course you will learn a powerful new workflow between Creating a 2D composition in photoshop and animating your artwork in after effects. We take a first lesson to explain the process of creating a matte painting of your composition in photoshop then we jump right into creating our project, by learning how to use photoshop projects in after effects , we learn ways to position our layers, Animating a flying bird , using our camera for animation and working with particles to create a realistic Snow from the scratch and finally rendering our project in after effects also for bonuses we will show you how to work with adobe audition and adobe premiere pro to edit and Mix a very Cool soundtrack for our project to bring our animation to life . This course is full of helpful tool for getting some of the toughest part of the photoshop and after effects working easy for you, issues like , animating a bird wings, camera movement, working with particles are explained in depth so you can let your creativity flow. This course is assuming you have intermediate experience in photoshop and after effects , however we take a step by step approach so you can follow along. If you have never used photoshop or after effects and you are interested to animate your artworks this course will show you how to start and where to focus on. by the end of this course you have a good knowledge of creating and animating your projects. This course is assuming you have intermediate experience in photoshop and after effects , however we take a step by step approach so you can follow along. If you have never used photoshop or After Effects I strongly recommend that take a beginner course to get more familiar with photoshop and after effects tools first then would be a time to watch this course. Over 36 lectures and 3 hours of content! Learn a powerful new workflow between Creating a 2D composition in photoshop and animating your artwork in after effects. By the end of this course, you'll know how to use photoshop to create a matte painting of your composition, how to quickly mask images in Photoshop, add color adjustments,add realistic painting to your image by using Clone Stamp tool, How to use different brushes and how to animate a bird in after effects, you will learn the secret of repeating an animate . how to work with layers inside the after effects . Moving a camera to bring the photo to life . animating the cloud and creating a realistic Snow would be so easy for you after watching this course . Add a dreamy look to our final composition and at the end you will learn how to Select, Create and Mix a Soundtrack to your final animation . This Course is for anyone who like to learn the composition in the photoshop and learn how to easily animate a 2D photo in after effects. It is for someone who has always wanted to learn an easy way to add motion to his/her graphics . 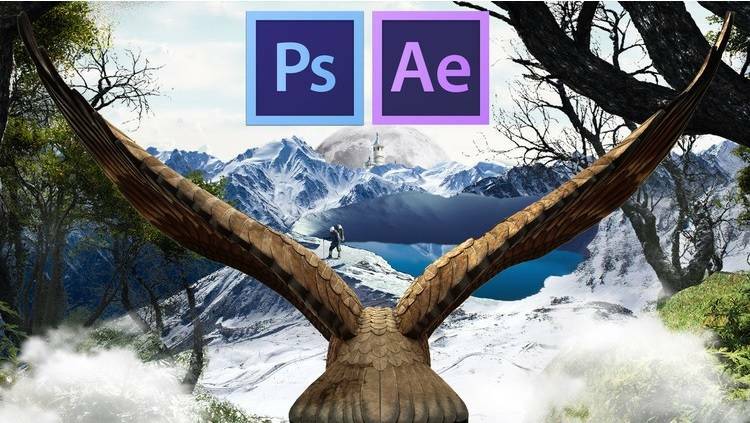 This Course is not a course to teaching you photoshop or After Effects tools, the goal is to learn how to do photo- composition in photoshop or matte painting and learn how to easily animate the layers (clouds, bird ) and creating particles in after effects. My name is Soli Art and I am A Motion Graphics, Interactive design & Commercial Photography Lecturer. You can Download the Exercise files by Clicking on the Download button: "files.zip"
Now it the time to put it into practice and try to paint the Mountain's photo yourself. then watch the video to find the solution . try to add the haze to the mountain your self, and fix the color then watch the lecture . you will learn How to use Channels In photoshop to combine the colors. We will focus on how to composite the mountain to the cloud to be realistic, kind of the peak of the mountain is coming out of the cloud look . How to create realistic shadows to combine the Castle to the peak. We are going to add the mood exactly behind the Castle , then we will learn how too use blending mode in photoshop to combine the mood to the background to get a realistic feeling. Its time to add a lake to the peak , we combine this from the eagle perspective , remember the eagle is flying over the lake . We going to work on the mountain's reflection on the water to create a realistic scene. Lets add some trees that are really close to the camera . would be like the eagle has passed through the jungle and reaching the lake and castle . Separating the eagles' wings from the right position is the key , so make sure you are zooming in to see the lines. Lets add some cloud and put them in front of the eagle so we don't really see whats going on from the start . Bringing our photoshop file layer by layer is only possible if we choose the Composition from drop box menu . We are going to learn how to change the Z-position in after effects to be able to move our camera into the picture. It has always been tough for animator to animate a bird without rigging in maya . but I will show you a quick way of animating the eagle in after effects. Repeating a 2 second animation and make it 20 second or longer can take so much time , but by adding a simple code into your timeline you can animate your short animation forever. We are going to work on Camera movement by using shortcut keyboards. We are going to rotate the eagle while camera has stoped. For creating the snow we are going to use trapcode particular, you can use the trial version for now to see how easily you can create any type of particles and animate it . Now its time to add a dreamy or cartoonish look to our final work. rendering has been never easier than this in After Effects . just make sure you are choosing the right format for your output. Download the Video and Mp3 files from the folder files . If you don't have Adobe Audition and Adobe Premiere Pro you can download if from adobe creative cloud website for 30 days for free. We use adobe audition to extract the file but basically audition is an ultimate software for mixing and editing any type of audio . then take it into premiere pro to do the final edit and match our soundtrack to the scene and finally render our in adobe premiere Pro. Thank you se much for your time. looking forward for your feedbacks for future tutorial videos .